Introducing a unique way to treat your dog to something special. 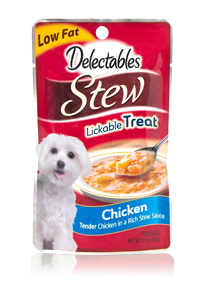 Delectables™ Stew Lickable Treats are a delicious and low-fat lickable treat. Simply open the pouch and pour into a bowl for a perfect in-between meal treat your dog will love! This Lickable Treat is made with tender pieces of chicken combined with peas, carrots and corn in a rich, delicious stew sauce. It’s also a great topper for dry food! Mixes easily and is sure to have your dog gobbling up every last bite. Delectables™ Stew Lickable Treats is made with, real meat, real cheese,real veggies, is low-fat and is the perfect size for that in-between meal treat.